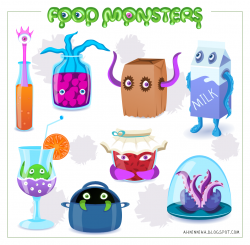 "Food Monsters Pack" contains .zip archive with the source file (format: SVG) and 7 separate images 256x256 (format: PNG with transparent background). Looks like "Cloudy 2" is bieng an influence on us already! Unfortunately, I haven't seen this cartoon, as well as the previous part. Actually, these monsters were drawn long time ago. Oh well. I though it might have been your inspiration.